The problem with raids against light side characters is you're suppose to win the raid at the end. And Star Wars is ultimately a kid's show simplistically where the good guys always triumph over the bad guys. There is plenty of fights ds triumphed. wait what.. Traya is evil??? you sure..
Endor raid, with shield generator, Palp + Vader and, finally, a ship battle to bring down the Death Star. Jedi Luke reward. Do it, CG!! I would rather have a ship raid. We should have a raid against Gungans. It would make anyone feel good to be the bad guys! It's funny how many people seem to think the Galactic Republic were good guys in the prequels. Doesn't anybody remember that both sides were being run by the same guy, and that the clone troopers from the prequels and the storm troopers from the OT are essentially the same troopers? I have wondered this since I have begun this game. * The Pit: Vs The Rancor, Essentially a bad guy because he/she is never shown in a light other than destructive. Plus it actually eats people which is awesome. None of these are bad raids, I just think that it is funny that none of them are centered on going after the Jedi. In many games of the past the developers have found ways for the customer to make a choice of going down the Light vs Dark paths. YES we can go against every one of these raids using Dark Side toons, BUT Why cant we whoop up on Some Jedi? So I am not here to complain. It is just a simple observation. I apologize if this has been hashed over already and answered. If it is please direct me to that thread so I can read it in full. My Suggestion if it has not already been hashed over. In the next major client update. Consider creating a 4th Major Raid. Vs Jedi. Throw at us, Obi-Wan, Anakin, Mace, Yoda, Qui-Gon and others. BALANCE THE FORCE here and let us "Darksiders" bring the war. Because at its core, Star Wars is a story of light vs dark and the ability to overcome the evil. So most games put you in as the hero. In fact pretty much all(99%?) of games do this. As a major fan of the Empire I wish they would focus more on them. To date its 18 imperials to 34 rebels. I hope they will do some more dark side themed pve events. I enjoy destroying the rebel and jedis. Because at its core, Star Wars is a story of light vs dark and the ability to overcome the evil. People like to say that, but whether we consider what's currently canon or look to all of the old EU, "light" doesn't win very often in Star Wars, and when it does the victory usually doesn't last very long. It doesnt win often? Really? It wins as often as it loses, thank goodness. Without wins and losses there are no wars and therefore no stories. And the Jedi ruled for a thousand years, so that's not is not a short period of time. Also the rebellion is still in control of the galaxy during episode 7, 8 and 9. The film makers just dont talk much about it because fake politics is boring. Except that it's not. The prequels were a three movie sequence about the bad guys winning in the end. The Clone Wars is an entire series about a war where both sides were being run by the same sociopathic monster. Hey, don't disrespect the Senate please. I do think that some kind of Order 66-style event would be the best (and only) fit for this style: the Jedi were wiped out, leaving room for the Empire. It's pretty much the only time where the bad guys won. (Yes I know that also happened in The Last Jedi, but I don't think a three-stage space chase ending in a fight against a Luke Hologram would work very well). Although, if you want to get crazy, there's always The Force Unleashed DLC missions where you literally kill Old Ben twice and turn Luke to the Dark Side and fight a Jedi-trained Leia. Now that is a dark-side worthy raid! (Though highly unlikely to happen but goddamn what a raid it would be). 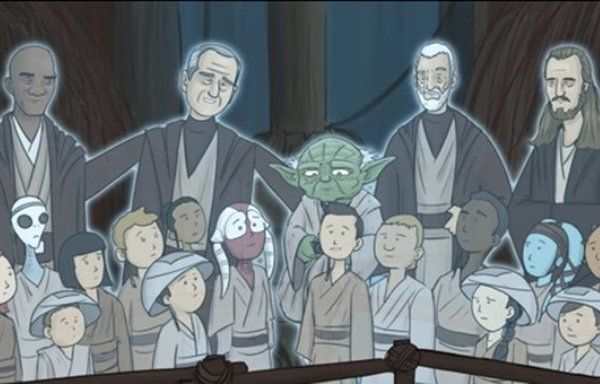 Who's the old guy between Yoda and Windu? (Yes I know that also happened in The Last Jedi, but I don't think a three-stage space chase ending in a fight against a Luke Hologram would work very well). Here's an idea that I floated back in 2017 ... I thought it was pretty good, still do, could use some updating for newer characters. Sort of a cross between a raid, and an assault battle. Call it a "Feature Battle" or something. Wow, there have been so many good ideas floated on this board, it is hard to recall all of them. Those that resonated with me were more storyline dependent. Since we need more end-game content, they must require specific squad compositions/factions to complete them. Assault on the Imperial Shipyards. The Imperial R&D director Admiral Zaarin has gone rogue! Assemble your forces and liberate the research facility. Earn TIE Defender shards. Defeat the Sentries: The shipyards are well-guarded. Penetrate the outer defenses and disable the station. Requires Grand Moff Tarkin, Imperial Star Destroyer Executrix, Imperial TIE Fighter, TIE Advanced x1, TIE Reaper, TIE Bomber; if you have T/F, T/R, or T/B you get a squadron (3?) of each to arrange/reinforce as you please. Regain the Facility: The platform has been disabled, now secure it and its vital technology. Requires General Veers, Darth Vader, Stormtrooper, Magmatrooper, Snowtrooper. Rebel Sneak Attack: The Rebels are attacking while the defenses are down. Repel the invaders! Requires Director Krennic, Shoretrooper, Deathtrooper, TIE Fighter Pilot. Secure the Shield Generator: Rebel troops, officers, etc. Secure the Perimeter: The Rebels are bent on destroying what they can before they leave. Stop them! Requires Grand Admiral Thrawn, ISD Chimera, Gauntlet Starfighter, T/F, T/B. So that's an Empire example. It could be a week-long event that runs daily, either PvE or GvE, whatever. For PvE, it could be hosted on a "feature" table (like a GW table) that changes every week or so. For GvE, it could be like a raid to allow more collaboration so not everybody would need every character in order to advance the objective. In addition to T/D shards, rewards could be ship building materials and/or something completely different, perhaps some kind of "style" points that could be used to customize the skins of your ships or characters. Or maybe some ship omegas. Guilds could earn bragging points to show how superior they are. And of course, an Achievement with more Darth Vader shards (or perhaps something more useful). I also like the idea of a Hoth assault where you get to play both sides of the board, Rebels advancing from the left, Empire from the right, until they meet in the middle. And don't forget the Wampa supply room, the weekly event where you have to clear the Wampas out of the supply rooms to recover valuable gear before the Imperial assault arrives. First Order raid on Resistance base. Please. Or a raid using Tuskin raiders against shmi... finally put them bad boys to use. I still think they should make a raid against younglings. Disney will surely allow it. Rancor is just being a rancor. It doesn't know good or bad. Only smash and eat. Actually I have thought about this. An empire cloud city raid. That’s what I was saying, a cloud city raid would be awesome. Anything beating on some LS toons would be awesome at this point. Phase 4.: Big a** Massive AT-AT. So yeah, would love to do some massive walker fights, as we think a raid can really be “raidish”, if you fight massive “leviathan” like enemies. Plus it would be amazing to see the big walkers make their way into the game. It’s a holotable anything can happen! There is an imbalance of hero journeys and going against “bad guys” in raids. I don’t know if it will ever be different. This is something that has been brought up for a long time but never commented on. We finally have a journey that is DS!! So hopefully we can get a change. It would be awesome. Some of us are ds fanatics.